Jarvis V. Hollingsworth is a Partner in the Houston, Texas office of the international law firm of Bracewell & Giuliani LLP and has a fiduciary practice counseling Boards of Directors/Trustees of public and private companies and government and educational entities on their duties, corporate governance, and director liability. He advises clients on Sarbanes Oxley and Dodd Frank compliance and serves as the Corporate Secretary to Boards of Directors. He also heads the firm’s Public Entities practice group, advising clients on public and education law. Mr. Hollingsworth is currently a Regent on the Board of the University of Houston System where he serves as Immediate Past Chairman of the Board and Chairman of the Endowment Committee. From 2002-08, Mr. Hollingsworth served as a Trustee on the Board of the Teacher Retirement System of Texas (TRS), 2005-08 as Board Chairman. TRS is a Texas state agency which manages a $100 billion-plus pension trust fund. The fund invests in domestic and international securities, private equity, real estate, and hedge funds. Mr. Hollingsworth is also a former member of the Lehman Brothers Private Equity Advisory Board. 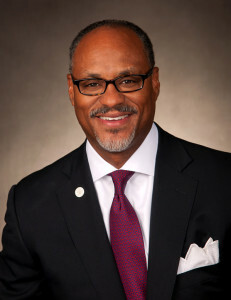 Black Enterprise magazine has recognized Mr. Hollingsworth as one of the 75 Most Powerful Blacks on Wall Street. He is a member of NASP New York’s Wall Street Hall of Fame, and has also received honors from the State Bar of Texas, The Texas Lawyer, the Houston Bar Association, the University of Houston Black Alumni and Law Alumni Associations, the NAACP, and the Thurgood Marshall Scholarship Fund. Texas Monthly magazine has repeatedly named Mr. Hollingsworth one of its Texas Super Lawyers. He is a former member of the Board of Directors of the State Bar of Texas. Prior to his legal career, Mr. Hollingsworth served for several years as a Captain on active and reserve duty in the United States Army, serving as a platoon leader, executive officer, and as an Aide-de-Camp to a Major General. Among other military decorations, Mr. Hollingsworth was awarded the Meritorious Service Medal and the Army Commendation Medal for his service. A native of Fayette, Alabama, Mr. Hollingsworth received his bachelor of science degree from the United States Military Academy at West Point and his Juris Doctorate from the University of Houston. He serves on the Board of Directors of Infogroup, Inc., on the Advisory Board of Haddington Ventures LLC, and as a Director of the Houston Health Museum. He is a member of the United Way’s Alexis de Tocqueville Society. He is married to Andrea, his wife of 27 years, and they have three children: Jordan (Morehouse College ’14, BBA-Marketing), Courtney (Howard University ’16, BS-Psychology) and Kendall, a junior at St. Agnes Academy.